Green sturgeon, juvenile, in tank. Photo courtesy of Dennis Cocherell, UC Davis. 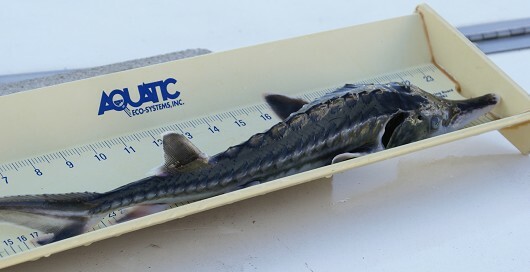 Green sturgeon, juvenile, on measuring board. Photo courtesy of Dennis Cocherell, UC Davis. Green sturgeon, larvae, side view. Photo courtesy of Dennis Cocherell, UC Davis. Green sturgeon, larvae, dorsal view. Photo courtesy of Dennis Cocherell, UC Davis. Green sturgeon, larvae, ventral view. Photo courtesy of Dennis Cocherell, UC Davis. Green sturgeon, larvae, swimming. Photo courtesy of Dennis Cocherell, UC Davis. Green Sturgeon are anadromous though they are considered the most marine of the sturgeon species and their life in freshwater may be relatively limited. Green sturgeon hatch in freshwater and may leave as yearlings or stay in a river for up to 3 years. Most juveniles migrate downstream during the summer and fall of their second year. The juvenile fish usually remain in the estuary for a period before dispersing into the Pacific. Green sturgeon are benthic feeders that use their barbels and protruding ventral mouth to find prey. In the estuary sturgeon may feed on amphipods, opossum shrimp, clams, or anchovies. 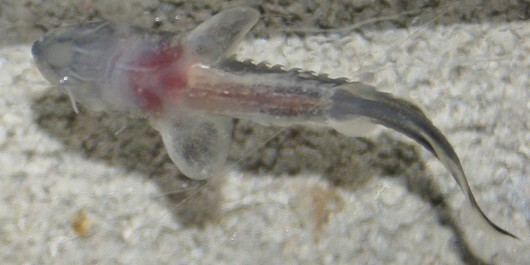 The diet of a sturgeon in the ocean may include sand lances and callianassid shrimp. Sturgeon also feed on other fish. They grow at a rate of approximately 7 cm per year until they reach maturity which is typically at an age of 15-20 years. Green sturgeon spend 3-13 years in the ocean before returning to their natal streams. Males tend to spend less time at sea than females, and they mature earlier in life. Mature males do not become as large as mature females of the same age. Green sturgeon of the Klamath River begin moving upstream in late February to late July and spawning takes place between March and July. Sturgeon spawning occurs above cobble in deep, fast water. Each female produces 60,000 to 140,000 eggs which presumably hatch after only 200 hours of incubation time. Green sturgeon have been documented as living up to 42 years, though some fish biologists believe they may have a maximum life span of 60-70 years.